Friday, November 18, 2016. 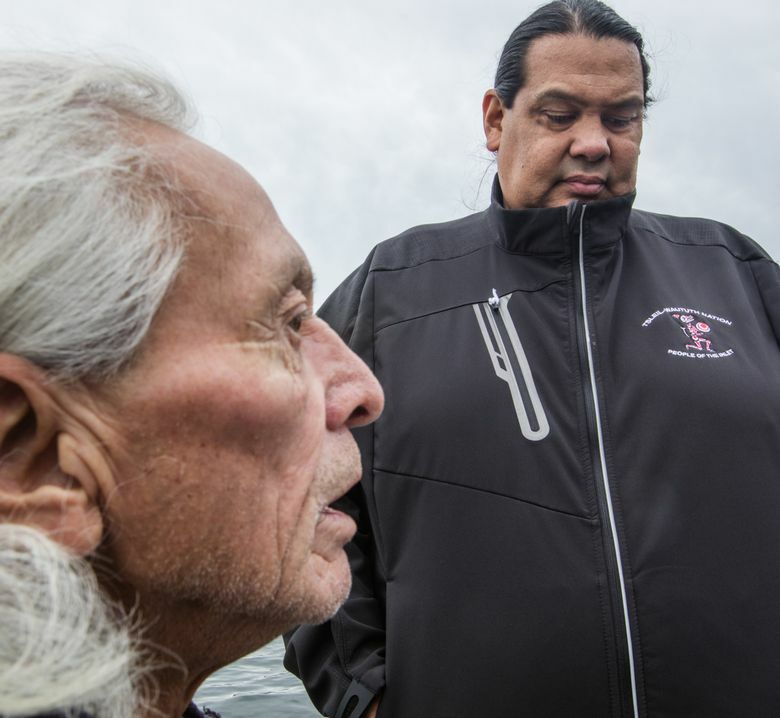 Tseleil-Waututh tribal member Ed Thomas, left and Rueben George on a skiff in Burrard Inlet next to the Kinder Morgan tank farm talking about oil spills and increased tanker traffic if the Trans Mountain Pipeline expansion is built. Expansion of the Trans Mountain Pipeline in Canada, which would triple the amount of oil transported from the Alberta tar-sands fields to a Vancouver-area port, faces opposition on both sides of the border, and multiple lawsuits. TSLEIL-WAUTUTH NATION RESERVE, B.C. — Canada’s Trans Mountain Pipeline expansion would nearly triple the amount of Alberta oil transported to the Vancouver-area port just across the water from this tiny First Nation reserve, where the Tsleil-Waututh people are battling a pipeline with far bigger capacity than the bitterly fought-over Keystone and Dakota Access pipelines in the U.S. The $6.3 billion expansion would position Canada to be the biggest oil producer in the Americas, and could be approved as soon as Monday by the Trudeau administration. • Would parallel the existing 715-mile oil pipeline from near Edmonton, Alberta, to Burnaby, B.C. • Would nearly triple capacity of transporting oil from Alberta to Burnaby from 300,000 barrels per day to 890,000. •Provides only West Coast access for export of Canadian oil products. Spur line connects to Washington refineries. Approval is not a slam dunk, said Gurpal Dosanjh, a refining analyst with Bloomberg Intelligence in New York. “It’s a really tough call whether the Trans Mountain would be built. With Canada, it’s just up in the air … it could go either way,” he said. Background stories: Here's a primer on the pipeline project, including the key players on all sides, a brief history of broken treaty promises and a closer look at the courtroom battle. And here's what we're reading related to the controversy. March 28: What the completed Dakota Access pipeline means for key players. Feb. 23: Dakota Access Pipeline protest camp closed; 46 holdouts arrested. Feb. 22: Preparing to leave, Standing Rock protesters ceremonially burn camp. Feb. 13: Judge rejects tribes’ bid to halt Dakota Access Pipeline; feds plan to shut down protest camp. Feb. 1: Hundreds rally as the Seattle City Council considers divesting from Wells Fargo because of its role as a Dakota Access Pipeline lender. Jan. 24, 2017: Donald Trump signs executive orders advancing the Keystone and Dakota Access pipelines. The Standing Rock Sioux tribe says it will push back. Live updates from from Seattle Times journalists on the scene Oct. 26, 27 and 28. Oct. 24: Citing treaty claim, protesters occupy land a rancher recently sold to pipeline developer Energy Transfer Partners. See photos from the Dakota Access Pipeline protests. Even it if is approved, Kinder Morgan could have a long slog ahead. The project is opposed by the mayors of Vancouver, Victoria and Burnaby, as well as many First Nations, and already faces multiple lawsuits. Major environmental groups, including Greenpeace Canada, Sierra Club BC and Raincoast Conservation, also oppose the project. The new pipeline, proposed by Kinder Morgan Inc., of Houston, Texas, the biggest energy infrastructure company in the U.S., would mostly traverse the same right of way as a smaller existing line — nearly tripling the capacity for transporting Alberta tar sands oil to the coast from 300,000 to 890,000 barrels a day. The company notes that pipelines are safer and cheaper than shipping oil by rail. In Canada, the pipeline has the support of the federal government. Kinder Morgan’s reassurances have also brought letters of agreement to the project from some 39 First Nations, according to Ali Hounsell, spokeswoman for the expansion project. With Canada’s oil production projected to surge by 850,000 more barrels per day by 2021, the pipeline is necessary infrastructure for one of the largest private-sector industries in Canada, said Chelsie Klassen, spokeswoman for the Canadian Association of Petroleum Producers. The United States is Canada’s largest customer, but also becoming its biggest competitor, as the U.S. develops its own oil reserves. That has Canada all the hungrier to move oil to other export markets on the Pacific Rim, Klassen said. But others — including Washington tribes that sought to block the project as intervenors before Canadian regulators to protect treaty fisheries — still oppose it. Concerns about spills and stoking global warming by increased use of fossil fuels have native nations and environmental groups on both sides of the border fighting the project. They are drafting momentum from the recent defeat by Washington tribes of a major coal-export terminal at Cherry Point, and the fierce resistance led by the Standing Rock Sioux tribe in North Dakota that has bedeviled the Dakota Access oil pipeline. Cam Fenton, Canada communications Manager for 350.org, an environmental group focused on climate change, says his organization is preparing for large-scale mass civil disobedience. The organization has already trained 1,000 people, including more than 300 “kayacktavists,” Fenton said. The Trans Mountain pipeline expansion is just one of several major fossil-fuel projects in the region that face strong opposition. In Longview, Millennium Bulk Terminals has proposed the largest coal-export facility anywhere in North America. In Vancouver, Tesoro-Savage has proposed an oil-by-rail transfer facility with the capacity to move an average of 360,000 barrels of oil every day. The Westway oil-by-rail expansion in Grays Harbor, home to key bird habitat on the Pacific flyway, and a treaty-protected tribal fisheries, is opposed by environmentalists and the Quinault Indian Nation. Oil to both the Tesoro-Savage and the Westway terminals would be transported in rail cars, which have been involved in accidents and spills, most recently in Mosier, Ore.
Kinder Morgan wants to begin construction on Trans Mountain in 2017 and finish by 2019. 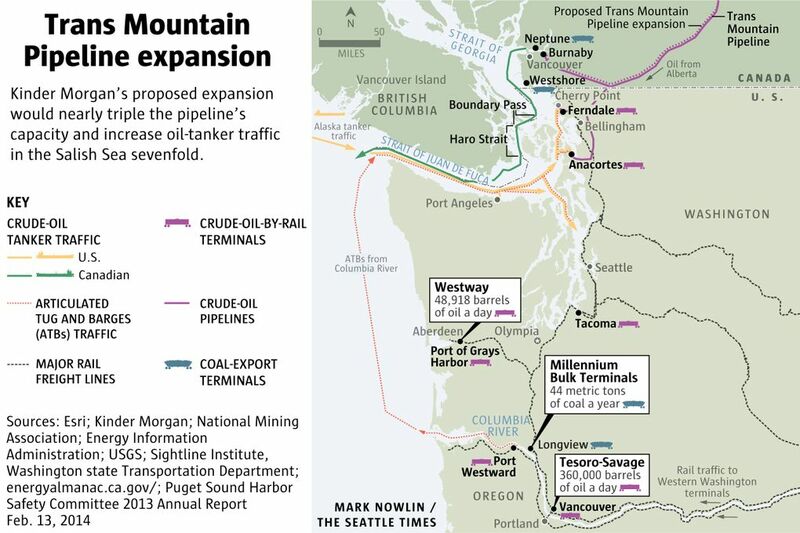 Kinder Morgan’s existing pipeline, which dates to 1953, provides critical access not only to refineries in Washington and California but also to export markets overseas. There have been no spills from tanker operations since the existing pipeline went into service, Hounsell said. There have been 82 reported spills since 1961 at pump stations and terminals along the pipeline. The company has promised to provide $150 million for improved response to a spill along B.C.’s shipping lane. The diluted bitumen and other products that would be shipped in the expansion is the same as Kinder Morgan ships from its pipeline today, and would be shipped in the same Aframax tankers that take delivery from the existing pipeline. Canada’s National Energy Board in May 2016, concluded the Kinder Morgan pipeline expansion is in the Canadian public interest, and recommended the federal government approve the project by Dec. 19, with conditions, including improved spill response. Many opponents say those protections aren’t good enough. 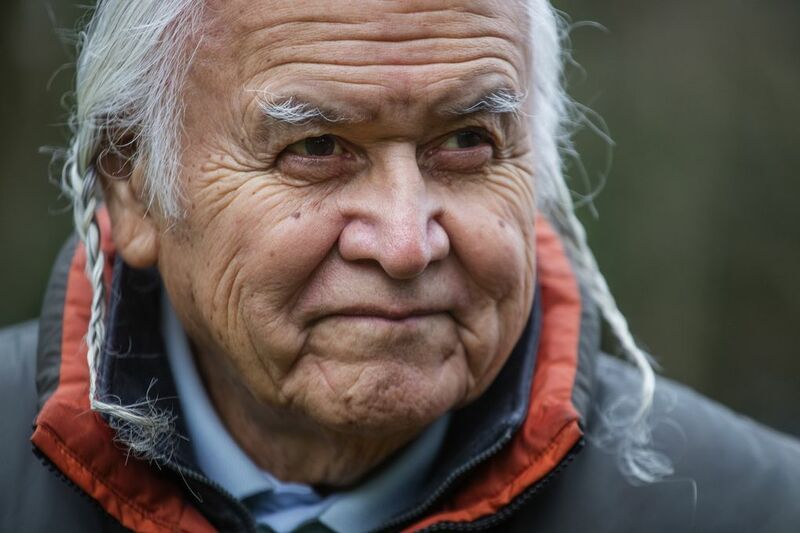 Beyond the soft handshake and diplomatic demeanor of tribal elders in the homeland of the Tsleil-Waututh Nation, where the pipeline terminates in the east end of the Burrard Inlet in North Vancouver, B.C., lies a steely resistance. What unites this tribal nation with tribes and communities across the border in Washington is concern for the shared ecosystem. 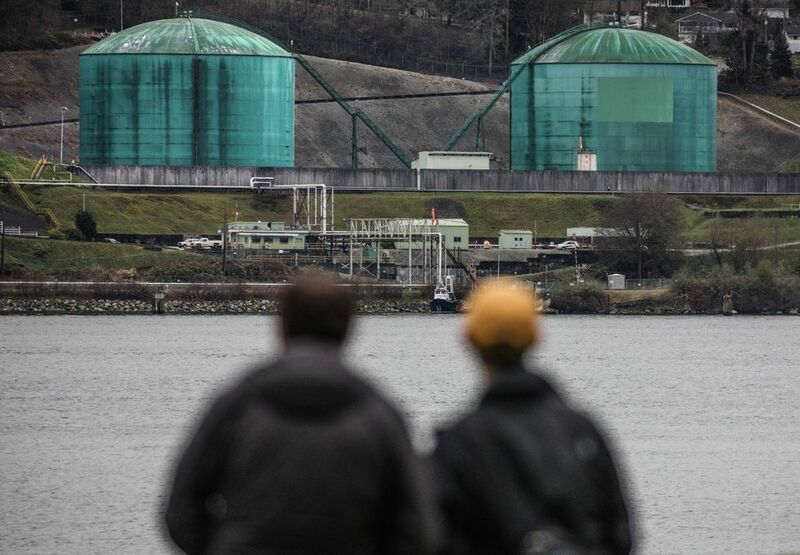 Kinder Morgan’s existing Trans Mountain pipeline terminates at the east end of the Burrard inlet across the water from North Vancouver. It’s not much to see: just the stub end of the buried pipeline, and a huddle of tanks on a hillside waiting to be offloaded once the next tanker comes to call at its modest dock. Under the Trans Mountain project, the dock would be expanded from one berth to three. The number of tanks holding the oil would more than double, and those would hold more than triple the amount of oil. Impacts from the expansion would be experienced far beyond the inlet. That creates a ninefold increase in the likelihood of a 2,500-cubic-meter or larger spill during the next 10 years in Haro Strait/Boundary waters — a core area of the endangered orca whale’s spring-summer habitat, analysts found. The National Energy Board’s imposed conditions for improved spill response are not good or specific enough, according to Washington’s Department of Ecology. The department also raised concern about unknowns surrounding diluted bitumen — a thick, viscous oil that requires mixing with chemicals to make it flow — that the pipeline would carry and its toxic effects. Spills could be damaging either from fuel-oil transfers to tankers, or from the diluted bitumen the tankers carry, the department warned in a September 2016, letter to the Canadian government. The unwillingness of Canada to help pay for the rescue tug stationed around the clock at Neah Bay to respond to a spill also was a disappointment to Washington’s ecology department. The assessment by the Tsleil-Waututh Nation found their people would bear the brunt of the impacts at the end of the pipeline. Hereditary Chief Sla-holt (Ernest George Sr.), 76, reminds a visitor his people have been here some 13,000 years, or, as they say here, since time out of mind. He and his neighbors think this stretch of water has already seen too much industrial development. Ed Thomas, 64, says efforts to clean up the inlet have just recently enabled the band to hold its first clam harvest in 30 years. Elk are coming back to the woods. So are cougar and bear, and the salmon in nearby Indian Creek. He doesn’t want to go backward now.